Barbara at Mommy Life is discussing meaningful children's books this week. 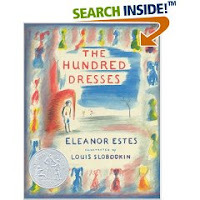 She touched on one of my favorites, The Hundred Dresses by Eleanor Estes. I can't read it without being impressed by Wanda's creativity in a cruel, impoverished world. I love this book. I didn't read it as a child, but my daughter has it, and I love it. A book(bigger - chapters) that you would be sure to love, and I'm sure I've posted about it before, but I just love it so much, is The Girl of the Limberlost. It is so much about making do with what you have and doing it with a cheerful attitude. It was reprinted not so long ago, so it may be in your library. If so, PLEASE read it. I'm embarrassed to admit this, but I've never heard of any of these books. I am definitely going to check them out! I read this book for the first time when I was homeschooling my eldest daughter. It caught me off-guard because it wasn't the typical shiny/happy children's book. I second your recommendation. Thank you for this post! I love these types of books! Joseph had a little overcoat is one of my favorites. We also have a book in our collection that I'm sure came either as a hand me down or was a yard sale find called A Chair For My Mother by Vera B. Williams. Teaches about a family working together to save for a needed item. After a fire, the family's new neighborhood came together to give their extras to this family. Really great lessons! So much for the full title and author of this book. My teacher read it to us when I was in 1st grade --- and it was one of my favorite books! That was over 40 years ago! I'm really excited about 'hearing' about it again. I wonder if I can find a copy somewhere. . . I love that story about the Hundred Dresses, but haven't thought of it in years. Glad to know that others like it too!! You'd probably also enjoy "A New Coat For Anna". Very thrifty, and a true story too!